Potato industry fears over the spread of the new Dark Green 37 strain of blight to England last year have prompted an appeal for more potato “scouts” to be on standby this season. As tattie growers continue to wait for the right conditions to start planting the 2018 crop, AHDB Potatoes has stepped up its decade-old Fight Against Blight (FAB) campaign with a new app to help farmers and agronomists respond to blight outbreaks by photographing crops in field and sending samples of plants for analysis. Gardeners and allotment owners are also being targeted to join the industry’s team of voluntary blight “scouts” which provides information on where infection is concentrated. A typical blight pressure season can cost the industry an estimated £55million a year and since its detection in 2013, the EU 37 strain, which is insensitive to the key fungicide Fluazinam, has been found in areas of Belgium, Germany, north-west France and England, leading to fears it could spread to Scotland. Perth-based WCF Horticulture, which buys seed from 44 mainly local growers and is the largest packer of seed potatoes to the horticultural market, is behind the campaign to harness the support of gardeners. 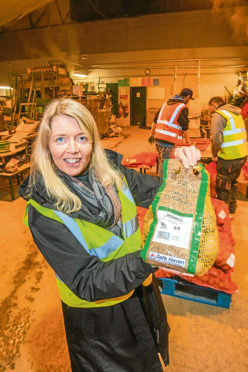 The company was the first Safe Haven accredited packer of seed potatoes in the UK and has a long-standing relationship with Safe Haven growers. General manager Heather Hughes said: “It’s very important that we look out for one another as an industry so including gardeners and allotment owners in the fight against blight makes sense,” she said. The Safe Haven scheme covers 60% of all seed production in Great Britain.